Airspan | Santa Clara California, November 20, 2018 – Airspan Networks Inc. announced today that it has acquired Mimosa Networks Inc.
Santa Clara California, November 20, 2018 – Airspan Networks Inc. announced today that it has acquired Mimosa Networks Inc.
Mimosa’s acclaimed capabilities and innovation in wireless broadband point-to-point and point-to-multipoint networks strengthens Airspan’s award-winning, disruptive position in the Mobile 4G/5G network densification space and expands Airspan’s existing North American presence with an engineering center in Silicon Valley. The deal strengthens Airspan’s innovative leadership in 5G network infrastructure by leveraging the combined teams’ technologies and products, sales channels and customer base, driving next-generation wireless solutions into a broader set of market opportunities. Airspan’s global customer base includes Mobile Operators, Cable/MSO’s, CSP’s, Wireless ISP’s and private network operators in public safety, utilities, oil and gas and air to ground. Airspan is also the only major American network infrastructure company to offer 5G solutions to a worldwide market. 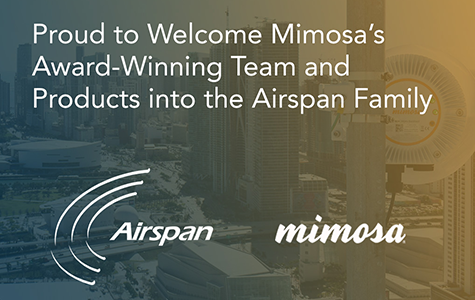 Airspan will continue to leverage the robust Mimosa channel-led sales strategy. This channel strategy will also be used to enhance the distribution of Airspan’s existing products for specific vertical markets, such as private LTE and applications in the newly available CBRS spectrum band. “This important step in Airspan’s growth emphasizes critical new solutions in mobile and broadband and the addition of the Santa Clara team strengthens our capabilities in the disruptive massively scalable densification techniques that are required by the 4G/5G telecom expenditure cycle currently underway. Mimosa brings important intellectual property to the table and accelerates AIrpsan’s path to delivering 5G features such as Massive MIMO to the industry” said Eric Stonestrom, CEO of Airspan. “Furthermore, Mimosa’s disruptive and award-winning fixed wireless technology addresses the rapidly growing wireless broadband markets and further establishes Airspan as a leader in the convergence of densified 4G/5G mobile network backhaul and Broadband Access. Also the strong distribution channel allows Airspan products to be sold to many more customers. Airspan (OTC PINK : AIRO) is an award-winning 4G & 5G small cell access and backhaul solution provider, with over 1000 customers in over 100 countries. Airspan has an expansive product portfolio, which includes indoor and outdoor small cells, and all-outdoor, compact Micro and Macro base stations, a variety of user devices and network optimization solutions ranging from sub-6GHz to millimetre wave. Oak Investment Partners XI, Limited Partnership holds a controlling interest in Airspan. Airspan is not subject to the informational reporting requirements of the Securities Exchange Act of 1934 and, accordingly, does not file reports, financial statements, proxy statements, information statements or other information with the Securities and Exchange Commission. This press release contains forward-looking statements. All statements, other than statements of historical facts, including statements regarding our strategy, future operations, financial position, future revenues, projected costs, prospects, plans and objectives of management, may be deemed to be forward-looking statements. The words “anticipates,” “believes,” “estimates,” “expects,” “intends,” “may,” “plans,” “projects,” “will,” “would” and similar expressions or negative variations thereof are intended to identify forward-looking statements, although not all forward-looking statements contain these identifying words. We may not actually achieve the plans, intentions or expectations disclosed in our forward-looking statements and you should not place undue reliance on our forward-looking statements. There are a number of important factors that could cause actual results or events to differ materially from the plans, intentions and expectations disclosed in the forward-looking statements we make. Investors and others are therefore cautioned that a variety of factors, including certain risks, may affect our business and cause actual results to differ materially from those set forth in the forward-looking statements. We do not assume any obligation to update any forward-looking statements. Mimosa Networks is the global technology leader in wireless broadband solutions, delivering fiber-fast connectivity to service providers and enterprise, industrial and government operators worldwide. Mimosa access, backhaul, and client solutions are deployed in a hybrid-fiber-wireless architecture, and engineered for both Point-to-Point and Point-to-Multipoint connections, across a variety of diverse applications including residential and business high-speed internet access, surveillance, agribusiness, education and hospitality networking. Mimosa’s technology delivers unprecedented levels of cost-effective spectral efficiency, allowing scarce spectrum to be concurrently and reliably shared across networks. Founded in 2012 and headquartered in Silicon Valley, Mimosa is sold worldwide by members of Mimosa’s partner program. For more information, visit www.mimosa.co.